Why not upgrade your office seating experience? - Our premium replacement caster wheels are made to fit any 5 wheel office chair with standard size stem. - You'll love the smooth feel and quiet movement of our office chair casters. - This office chair caster set is made of top quality superior grade steel that will safely support up to 500lbs. - With our caster wheels you can rest assured that they will last for many, many years to come providing great comfort and value to your business. Your employees and colleagues will thank you for upgrading their working environment and adding style and comfort to their working space. We have a no hassle 100% guarantee refund policy. If you use this and do not love it, simply return it for a full refund. You have nothing to lose. Consider picking up an extra set as a gift for your friend or colleague or a spare set for your office. FITS 99% OF ALL OFFICE CHAIRS - Our boxed set of premium replacement rollerblade style caster wheels will fit 99% of all standard stem five wheel office chair (Doesn't fit IKEA office chairs), making the work day easier and more convenient for the user. VERY EASY ASSEMBLY - A simple 2 step assembly process, just take your old casters out and push your new ones in, and you are done! PROTECT HOME AND OFFICE FLOORS- These 3 inch casters feature a hard polyurethane rolling surface, quietly gliding over carpet, tile, vinyl or hardwood without scratching, protecting the beauty of your flooring. LIFETIME DURABILITY - These top quality polyurethane, rollerblade style, swivel wheels will last a lifetime; they are made of top quality superior grade steel that will safely support up to 500lbs. GUARANTEE - We have a no hassle 100% guarantee refund policy. If you purchase our Clever Casters Replacement Wheels and do not love them, simply return for a full refund, even used. Add a set to your cart today! 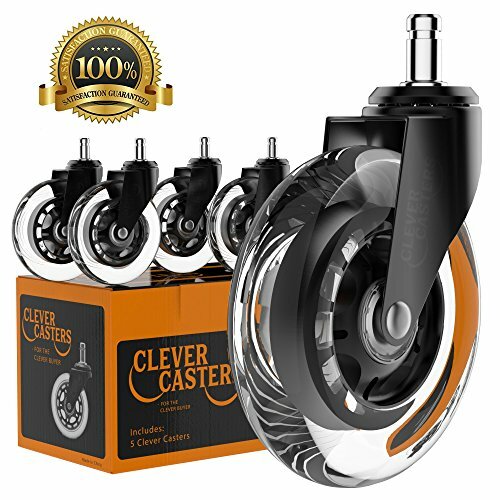 If you have any questions about this product by Clever Casters, contact us by completing and submitting the form below. If you are looking for a specif part number, please include it with your message.